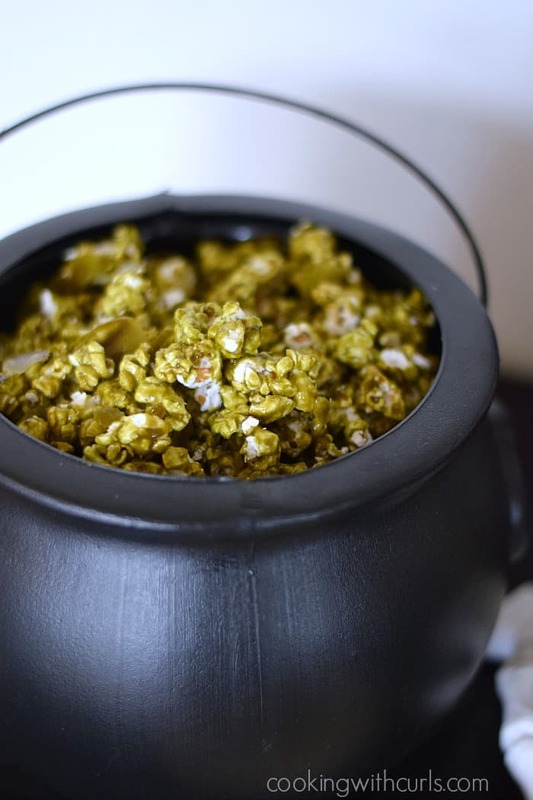 Today we have a fun, Halloween party treat that could go by several different names. 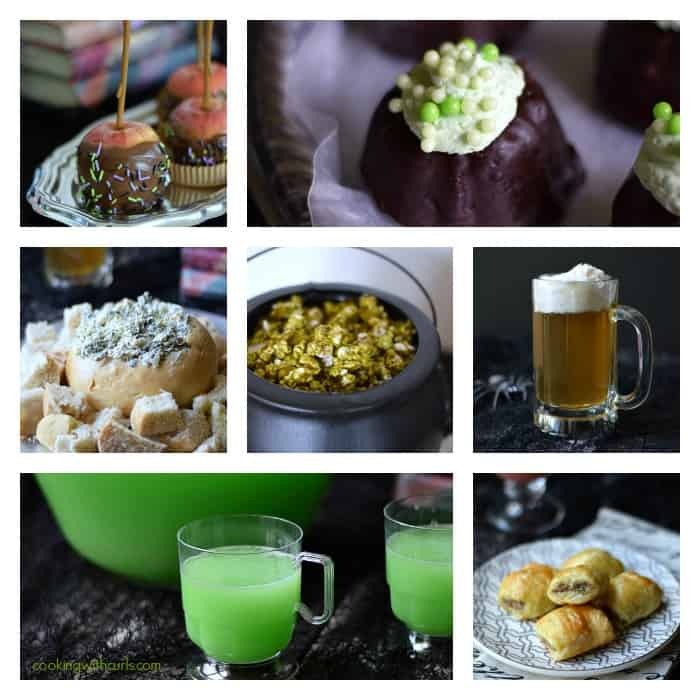 I went with Troll Boogers for the Harry Potter Party, but you could also call it Zombie Boogers, Green Slime Popcorn, Grinch Popcorn for Christmas parties. It would also work perfectly for a St. Patrick’s Day party! If you have little kids, I’m sure they could even come up with some interesting names for you to use, lol. I suppose I could have stuck a wand into the Troll Boogers for effect. 😉 I have this little problem when I create the menu for parties…I come up with too many recipes! My focus was getting every idea in my head, made and on the table for the party. Staging, well let’s just say that wasn’t my top priority. I was also trying to keep the costs down. Sadly, I do not have Martha Stewart’s budget for parties! 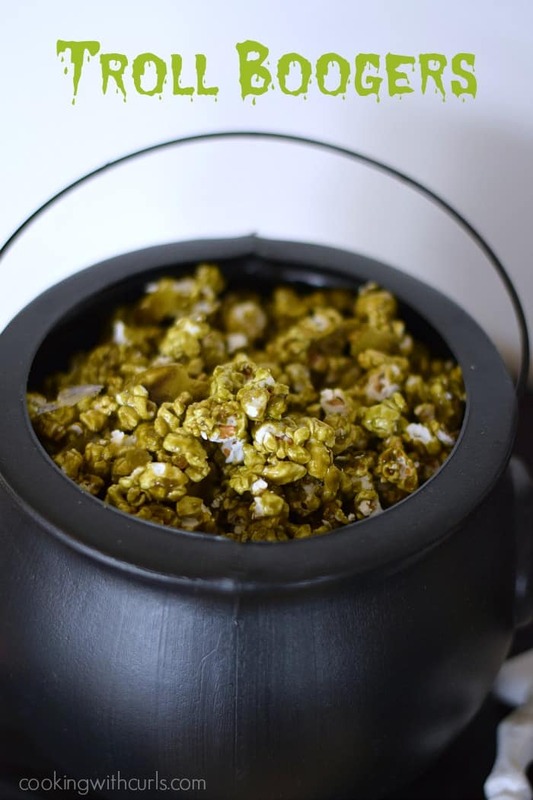 This candy coated popcorn is actually pretty easy to make, it just takes a bit of time. 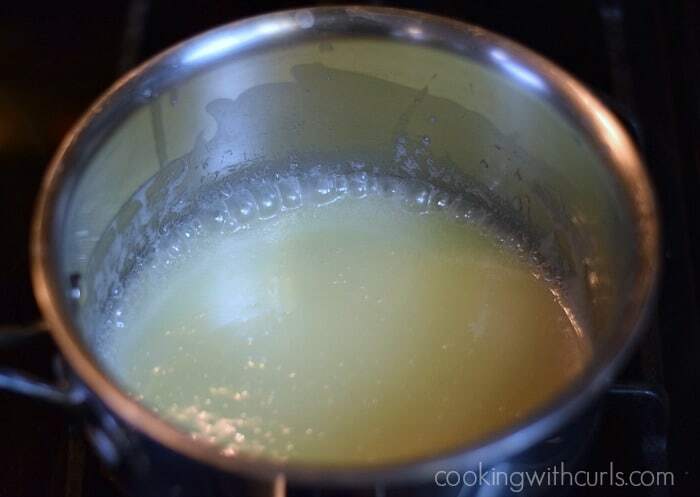 Place the sugar, butter, and corn syrup in a saucepan and bring to a boil over medium heat….. Boil without stirring for 5 minutes. 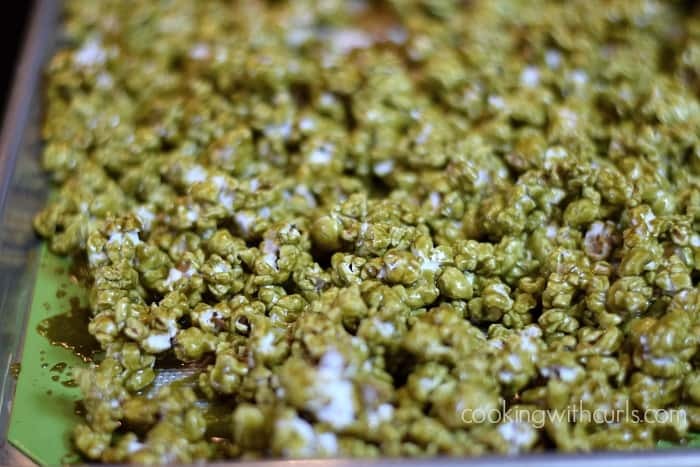 Remove from heat and stir in the baking soda, vanilla, and green coloring…..
Place popcorn in a large bowl, and pour the mixture over. Stir until completely coated…..
You guys know the microwave popcorn trick, right? Place 1/3 cup popcorn kernels in a brown paper lunch sack and heat in the microwave for 3 minutes and 50 seconds. I did this two times to make enough popcorn. 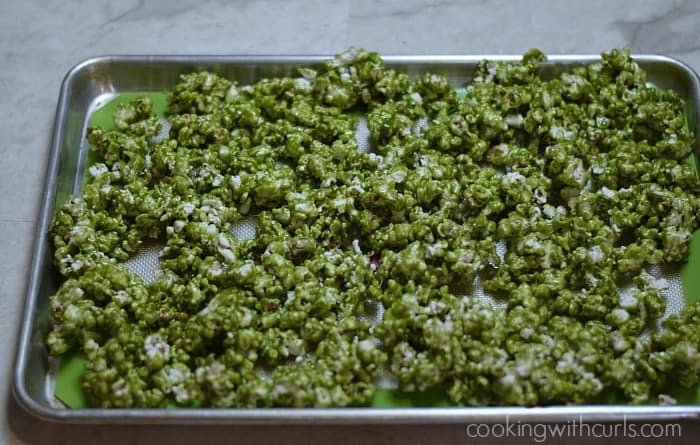 Spread the popcorn mixture out on a parchment/silpat lined baking sheet…..
Place in a preheated 250 degree oven for one hour, stirring every 15 minutes….. 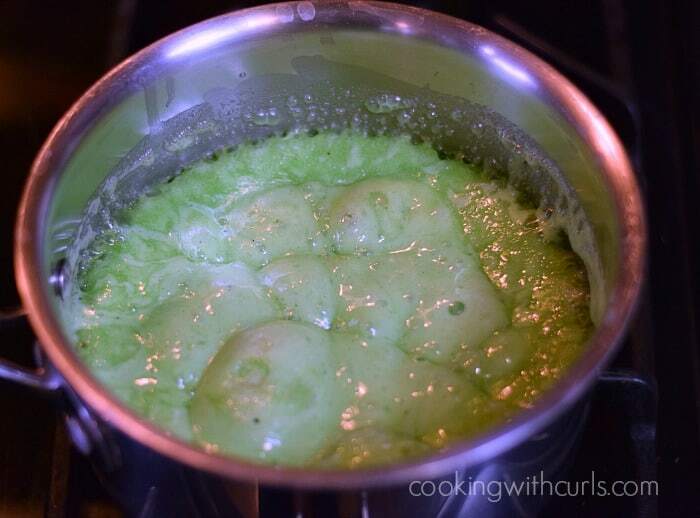 Warning, it is a gooey mess to stir! Doesn’t that turn a lovely, disgusting green color? 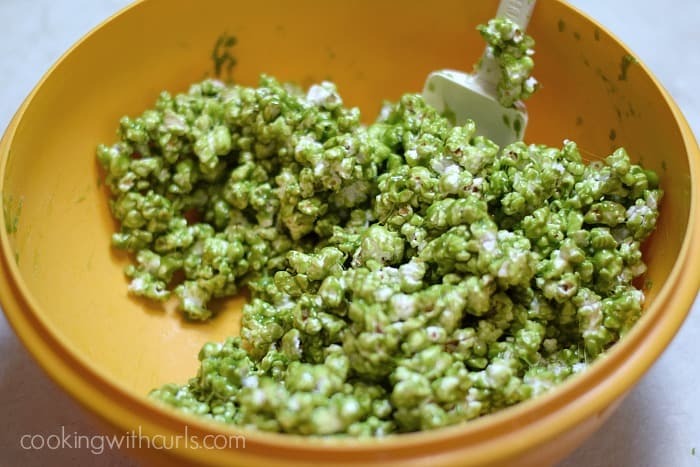 Allow to cool for 5 to 10 minutes, then break into pieces and serve…..
You can't have a Harry Potter Party without Troll Boogers, aka slime green candy coated popcorn. Preheat oven to 250 degrees. Place butter, sugar, and corn syrup in a medium saucepan and bring to a boil over medium heat. Remove from heat and stir in baking soda, vanilla, and green coloring. Place popped popcorn in a large bowl. 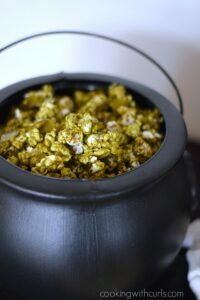 Pour mixture over popcorn and stir until completely coated. Spread popcorn mixture on a silpat/parchment lined baking sheet. Place in the oven and cook for 15 minutes. Stir and return to oven. Cook and stir popcorn every 15 minutes for a total of 1 hour. Remove from oven and allow to cool for 5 to 10 minutes. Break popcorn apart and serve. Store leftovers in a sealed container. *I used powdered lime green coloring. You could also use gel coloring. These are so so so fun! I’m loving all your HP party themed snacks. Totally inspired to host my own HP party very soon! LOL! Before I even clicked I was laughing… My gross boys would LOVE this and I’m pretty sure it would be a hit at any party or school function. Can’t wait to see the final menu. You totally hooked me with the title. Troll Boogers, what a great name!!! The color is absolutely awesome. This is such a fun recipe to serve at a Halloween party! Perfect for kids of any age!